Electro Chemical Etching (also referred to as Electro Etching, Chemical Etching, Electro Marking, or Electrolytic Etching) is the operation of pressing an electrolyte-soaked electrode onto a stencil that is placed over a metal part. The electric current from the electrode dissolves the metal material under the stencil, thus creating the desired mark. The depth of the electro chemically etched mark will increase based on the length of time the electrode is pressed through the stencil onto the metal part. Very sharp and crisp edges on chemically etched marks at depths up to 0.006"
Ability to make chemical etching stencils in-house. Simply email your logo or text and we will take care of the rest. Electro Etching was utilized to etch Manufacturing Numbers 0.002" deep onto the axis of this metal part per the customer's part marking specifications. Chemical Etching steel, in this case, yielded a dark, crisp mark that levied zero stress on this critical part. Electro Etching was utilized to etch Manufacturing Numbers 0.002" deep onto the periphery this metal part per the customer's part marking specifications. 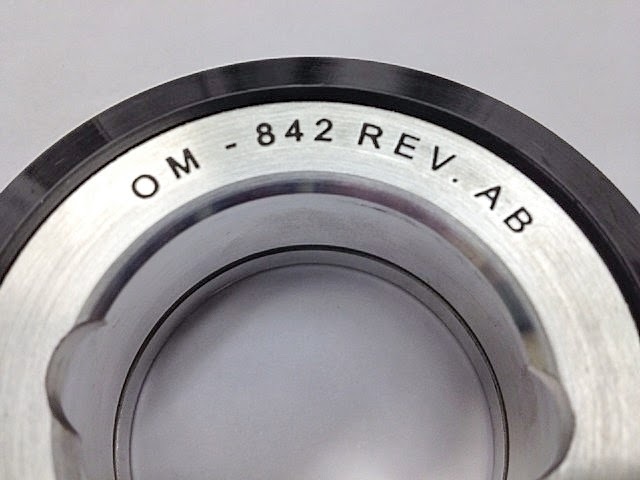 Electro Etching was used to etch 1mm high characters onto this 20mm diameter bearing race. A unique electroltic etching procedure was engineering by Universal Metal Marking for this high-run application. Laser Etching could have been a good alternative, offering crisp, legible detail with these small characters, however, electrolytic etching was elected due to low cost of operation and exceptionally high production rates, which yielded a substantial savings to the customer. 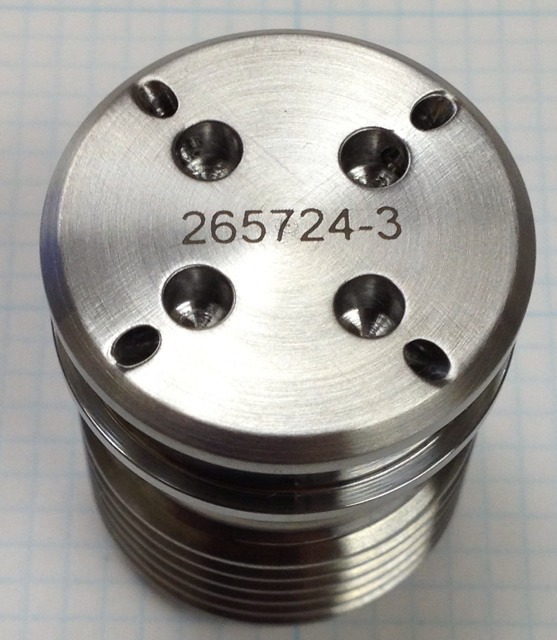 Electro Etching was utilized on a marking area of 0.25" to etch Manufacturing Numbers 0.002" deep onto the axis this metal part per the customer's part marking specifications. Electro Marking steel, in this case, yielded a dark, crisp mark that levied zero stress on this critical part. Electro Etching was utilized to mark 1/16" high Manufacturing Numbers 0.002" deep onto this metal part per part marking specification AS478. Chemically Etching steel, in this case, yielded a dark, crisp mark that levied zero stress on this critical part. Electro Etching was utilized to etch Serial Numbers and Manufacturing Numbers 0.006" deep into these metal parts per Marking Specification MIL-STD-130. 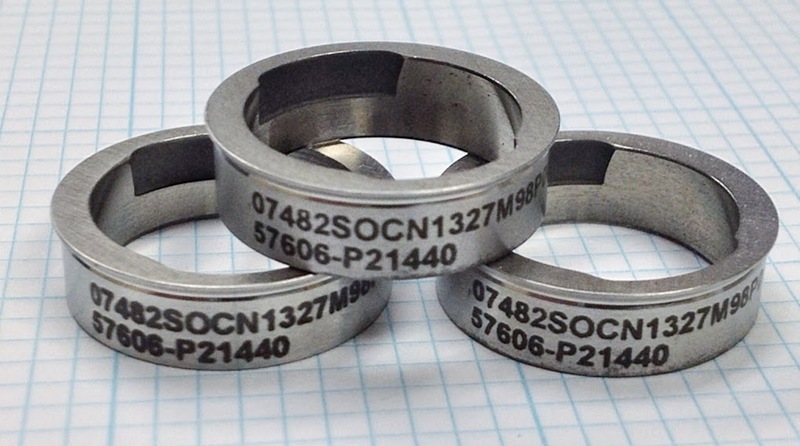 This part marking specification allows for various types of marking in the Aerospace and Military industries including Electrolytic Etching, Laser Etching, Laser Engraving, Metal Impression Stamping, Vibro Peening and more. While many marking methods are acceptable by Spec MIL-STD-130, not all are equal in quality or in economics. Electro Etching was utilized to etch this logo 0.006" deep into heat treated tool steel part. The tool steel is heat treated to 58 - 60 Rockwell "C" scale. This 1st article test part exceeded customer’s production requirements by more than 300 percent. Standard electrolytic etching services could not achieve the required depth while maintaining a crisp sharp image. Standard engraving methods could not maintain the sharp points within this logo. Traditional cutting tools could not economically cut the heat treated steel. Universal Metal Marking Co. has developed a system that will maintain crisp legible logos at .006" deep. Electrolytic Etching was utilized to etch this logo 0.006" deep into this aluminum part per the customer's part marking specification. Electrolytic Etching yielded a deep, crisp mark that levied zero stress on this critical part. We can also Electro Etch stainless steel, brass, copper, titanium, and many more metals. 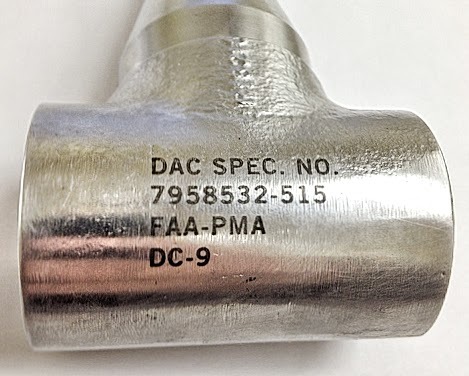 Electro Etching was utilized to etch these identification numbers onto the periphery of this metal part prior to painting per McDonnell Douglas Marking Specification DPS 3.27. This marking specification allows for various types of metal marking in the Aerospace and Military industries including Electrolytic Etching, Ink Stamping on Metal, Metal Impression Stamping, Vibro Peening and more. While many methods are acceptable by Spec DPS 3.27, not all are equal in quality or in economics. Grit Blasting or Abrasive Blasting is the process of pneumatically thrusting a high-pressure stream of fine grit (or another abrasive material such as fine sand, glass beads, or silicon carbide) through a stencil that is placed on the part, thus removing surface contaminants and yielding a crisp mark. Historically, Grit Blasting has been a very slow and laborious process. However, UMMCO has married Grit Blasting technology with CNC and Cad Cam to achieve clear marks. Copyright © 2012 Universal Metal Marking Co. All rights reserved.